Tomken offers private and commercial sales of aftermarket Jeep parts to customers throughout the United States, with many different years and brands available. On occasion, we have sold auto parts to customers outside of the country, including Australia and Japan. We are proud to say all of Tomken parts are made here in Buena Vista, Colorado. What Model do you have? If you own a CJ-5,7,or 8, your vehicle has a 3 or 4 speed manual transmission, front and rear leaf springs, most likely a Dana 30 front axle, and an AMC model 20 rear axle. 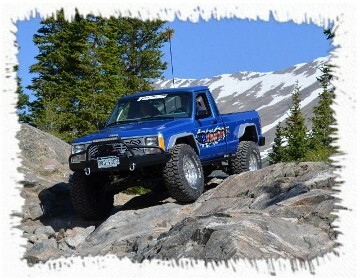 Most transfer cases in the later models were Dana 30’s. Earlier vehicles had T-18’s or T20’s. We recommend: We make parts for model years ’76-’86. For stock vehicles it’s a good idea to upgrade the shackles and hangers for strength and safety. Steering can be improved with a shackle reversal kit and steering box support. Also the factory U-bolt plate are common weak point, and should be replaced with a heavy-duty U-bolt skid plate which also provides U-bolt and shock protection. If your pink slip says Wrangler you have a YJ ('87-'96). It came stock with. either a 5-speed standard or a 3-speed automatic. 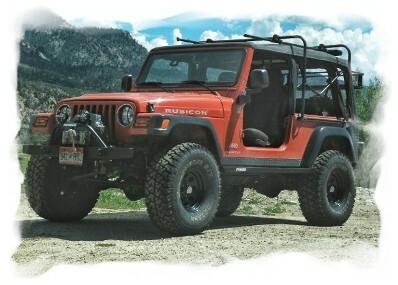 Like the CJ it has leaf springs front and rear. The front axles were Model 30's (with vacuum operated disconnect), and the rears were Model 35's, with a 44 upgrade available. The transfer cases were called Command Trac (N.P. 231). Command Trac means you have a choice between 2 wheel drive & 4 high or low. We recommend: For stock vehicles it's a good idea to upgrade the shackles and hangers for strength and safety. Steering can be improved with a shackle reversal kit, and steering box support. Also the factory U-bolt plates are a common weak point, and should be replaced with a heavy-duty U-bolt skid plate which also provides U-bolt & shock protection. Recognizable features: Square headlights, leaf springs, & swing-out tail gate. The Wranglers were lower than the CJ. Lug nut pattern is 5 on 4.5". We recommend:The TJ comes from the factory a very capable off-road vehicle, howerver we highly recommend a gs tank skid plate. Also a sway bar disconnect will significantly increase articulation (keeping all tires on the ground). Recongnizable features:: Round headlights and coil springs. Lug nut pattern is 5 on 4.5"
In 2007 the Jeep Wrangler was redesigned, which is known as the JK. The JK comes in a two and four-door models. 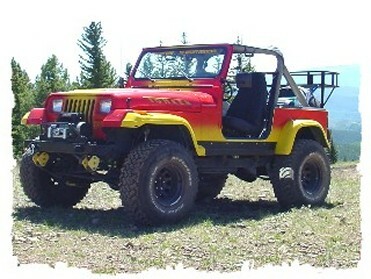 This next-generation Wrangler was significantly larger than the existing model, with a 2 inch longer wheel base and 3.4 in wider track, though the two door model is actually 2.5 in shorter in the overall length that the TJ, allowing for better approach and departure angles. With a larger available standard tire size of 32in, break over angle is unchanged. The Cherokee, or XJ is a real work horse. It comes from the factory with a 5-speed standard or 3-speed automatic with overdrive. Coil springs in the front and leafs in the rear, either a Command Track (N.P. 231) or Select Trac (N.P. 242). Lug nut pattern is a 5 on 4.5”. We recommend: The Cherokee has a longer wheelbase than the Wrangler, because of this, ground clearance is more of an issue. 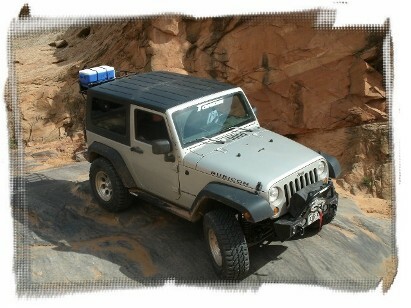 A lift kit, rocker skids or both are very helpful off road. Also many XJ owners switch to our bumper and swing-out to get the spare tier out of the interior. Tomken makes a complete line of parts for the XJ enthusiast. Grand is a great word for this Cherokee. We have been very impressed with what the ZJ will do when properly equipped. Grand Cherokees are offered with a 5-speed manual w/overdrive, or 4-speed automatic w/overdrive. Front and rear four link coil springs. The transfer cases are either a N.P. 242 or N.P. 249 (full time four wheel drive). Lug nut pattern is 5 on 4.5”. 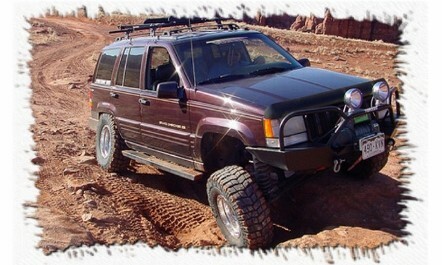 We recommend: Like the XJ ground clearance is a issue for the longer vehicles. 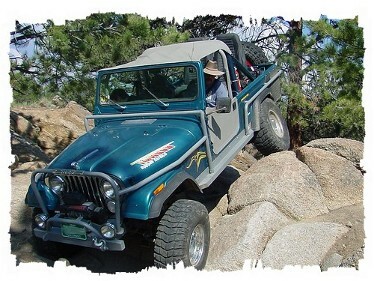 Rocker skids and/or lift is recommended even for moderate off roading. The Jeep Comanche (designated MJ) was a pickup truck version of the Cherokee compact SUV that was produced from 1986 to 1992. Rear-wheel and four-wheel-drive models were produced. 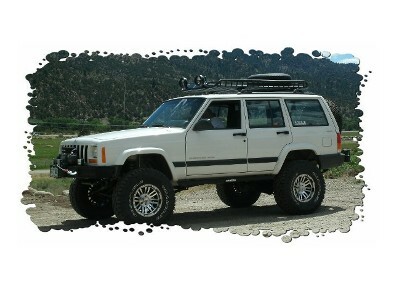 The Comanche used the Cherokee’s front suspension, with coil springs and upper and lower control arms. The Cherokee and Comanche were the first Jeeps to use this new “Quadra Coil Suspension Coil springs allowed for greater ride comfort and axle articulation during off-road excursions. A trackbar was used to keep the axle centered under the truck. For the rear suspension, the truck used leaf springs that were considerably longer than on Cherokees, which gave the Comanche a good load-carrying capacity and smooth ride.